We had a great time tonight at the New York City WPF/Silverlight Meetup. I showed everyone the Silverlight Unit Testing Framework that comes with the Silverlight Toolkit. 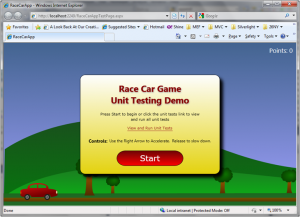 Our samples were centered around a side-scrolling race car game that was a lot of fun for me to create. Thank you to everyone that attended. My slides and Race Car Application are available for download using the links below.